It seems like a good time to tell you about some cheeses I sampled lately. I got a Murray’s gift card for the holidays (thanks, Rondo) and about a week ago I decided with it being a new year, what better time to try a new cheese? So, I swung by the Murray’s counter in Grand Central Market. I spied atop it a Swiss cheese called Etivaz. The label described it as being very exclusive, only available 4 months out of the year, comparable to the Gruyere of old. It went on to wax poetic of its “deep, lingering fruitiness, a barrage of roasted filberts, the lingering kiss of smoke” (ha! Murray’s, you said lingering, twice!) I gave it a quick sniff (through the plastic wrap), it was definitely fragrant… OK, why not? Then, I ran to catch my train. I just made it, and it was an older train. These ones seem to harbor certain odors. The car where I nabbed a seat was distinctly less pleasantly scented. But a seat’s a seat and my ride to my country abode is over an hour, so I stayed put. Perhaps if I’d’ve gotten up and gone to stand in a less smelly car, my evening with Etivaz would’ve turned out differently. As it was, I got home, found a pretty plate, opened some tasty crackers from Beecher’s, and arranged this nice shot. And then I cut off a bit of Etivaz and brought it close to my mouth. Hmm, that’s odd, this cheese both smelled and tasted much like the train from which I’d recently escaped. Now, I am not one to shy away from a aromatic cheese, but there’s stinky and then there’s just plain eww. Etivaz was the latter pour moi. So, guess what I did? I took it back! I don’t know if Murray’s policy is to just indulge the whims of their customers, but they did refund me. And they apologized and said it must have been a bad batch. A few days later, I got up the gumption to try again. This time, I decided to play it safer. I would still go for something new, but something that was less of a gamble. Again, I let the counter lead the way. I found Piave Vecchio atop it. Before pulling up roots and moving from NYC to NOLA, Mr. Piave had proclaimed this formaggio to be his favorite, thus earning his moniker. The label compared it to Parmigiano-Reggiano which is one of my most preferred, so I considered that to be high praise. Piave is from the Veneto, but oddly enough I don’t recall hearing that much about it from all the time I spent in and around that region. Northern Italians don’t worship P-R as much as I do, but they can go on and on about their local Grana. Aromas of fruits and nuts were referenced once again, but this time they bloomed nicely. Murray’s went on to suggest that Piave is easier to eat right off the wheel than P-R. I don’t know if agree with that bold statement, but I could likely put away a pound of P-R on my own, so I’m definitely biased. Finally, this past weekend, I was once again near that Murray’s counter (have you figured out that it’s a near-daily thing for me?) 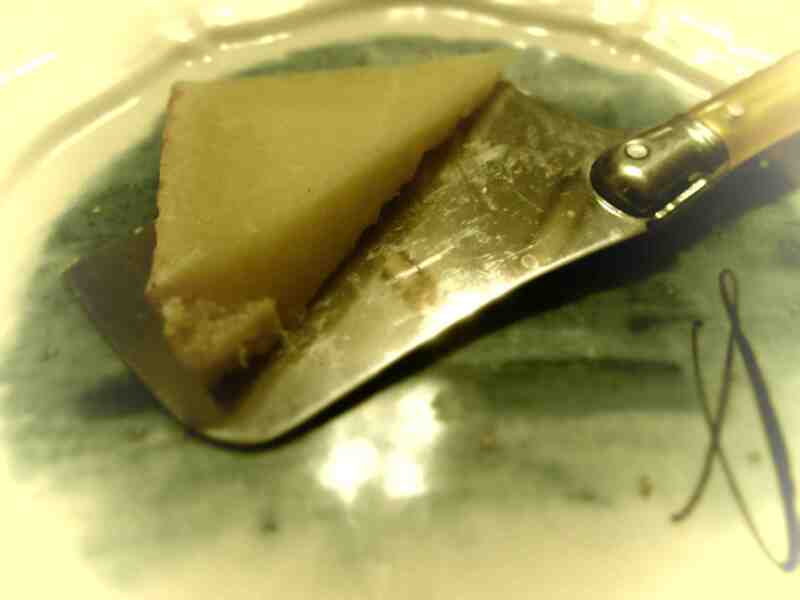 and realized that I have yet to feature one of my all-time favorites, Weinkäse Lagrein! This is a delectable cheese that I believe I first took a chance on some years ago, after reading its label and learning that it was made in the Alto-Adige, the northern most region of Italy, that was once Austrian pre-World War I, thus its Germanic name. I’ve spent a lot of time in that area in part because I love the mashup of two very unlikely cultures. They don’t really blend at all, but that sort of makes it all the more interesting to see them try! But here’s a blend that does work: take your cheese, soak it in a local wine (Lagrein) and herbs (including some fragrant garlic) for 5 days, age it for a further 6 weeks, and then, you get this beaut with tiny holes and a salami-like scent. I may be a 20 year vegetarian veteran who has no memory of what salami tastes like, but in my mind, this is it. And my meathead friends who’ve tried this käse have confirmed I’m not far off. I think you might could trick them in a blind taste test. Maybe. How have we been talking about cheese for almost one year without mentioning Comté? It has definitely been eaten in the last year, so let’s remedy that absence today. 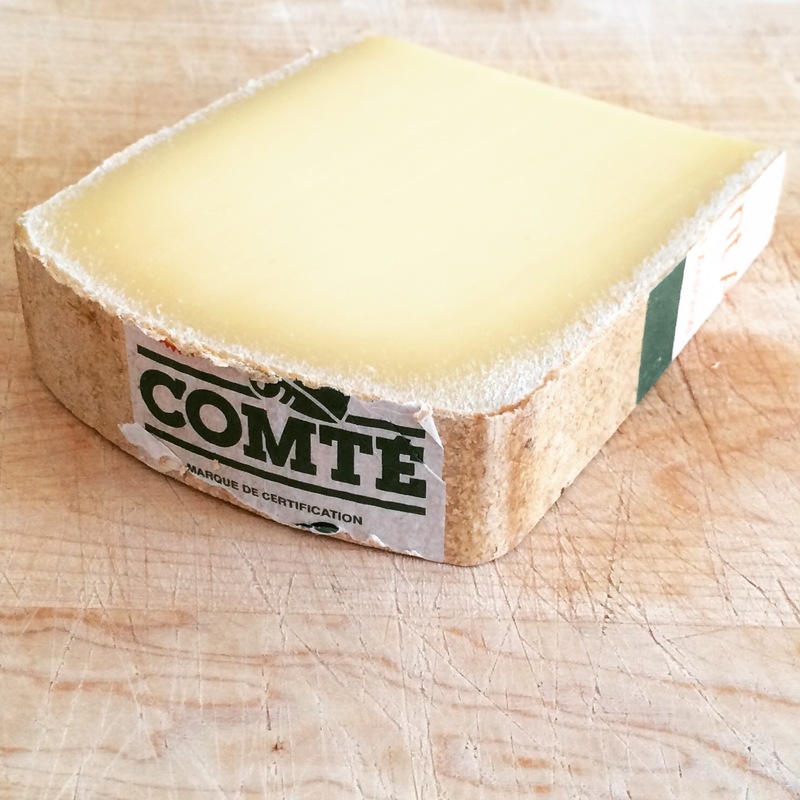 Comté first appeared on my radar in 2010 while living in Paris. A food blogger I love mentioned a 30-month aged Comté that he had picked up on rue Montorgueil. My curiosity piqued, I ran out the following Saturday, bought a chunk and brought it back to my little apartment in the 20th (of course picking up a crusty baguette on the walk home. Sigh…) From that night on, I have been very loyal to Comté – it’s my cheese-y boyfriend, my comfort snack, the cheese I eat on repeat. Comté is produced in the Jura Massif region of Eastern France using unpasteurized cow’s milk. It is matured to perfection in caves where something magical happens in the silence and darkness to give it its nutty, buttery flavor and (usually) silky texture. It is ripened for a minimum of 4 months up to 30 months. My local cheese shop sells 15 month-aged chunks, so I have a feeling the 30-month aged is rare and perhaps sold only in France. I could be very wrong about that, so on your next Comté shopping trip, look for the old stuff! Comté is a very nice cheese on its own, but it also pairs beautifully with a variety of wines, fruits and other delectable things that I will soon be sharing in this very space. Stay tuned!